We have good news for Martin Luther King Jr. Day! 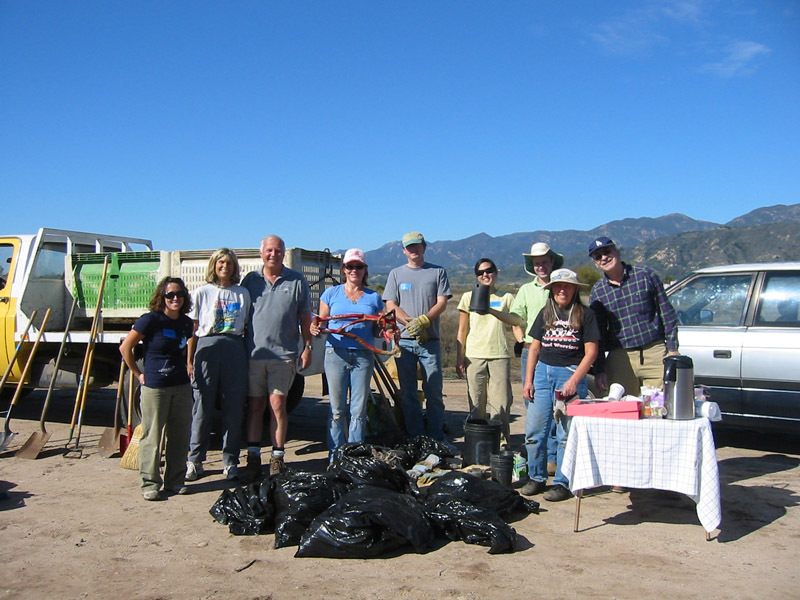 Patagonia and the Land Trust are facilitating a restoration work party, starting at 9AM on Monday. Patagonia is sending 6 volunteers from 9 to NOON; any local Salt Marsh lovers are welcome to join in and stay for as long as they like! Bring waders, if you have any! The best part for me was that I got to pester Andrea Adams-Morden (second from the right in that second picture) with all manner of questions about the plants we were pulling up, and the ones we were putting in. Andrea is the volunteer coordinator for the marsh docents, and knows an awful lot about the plants in the marsh. 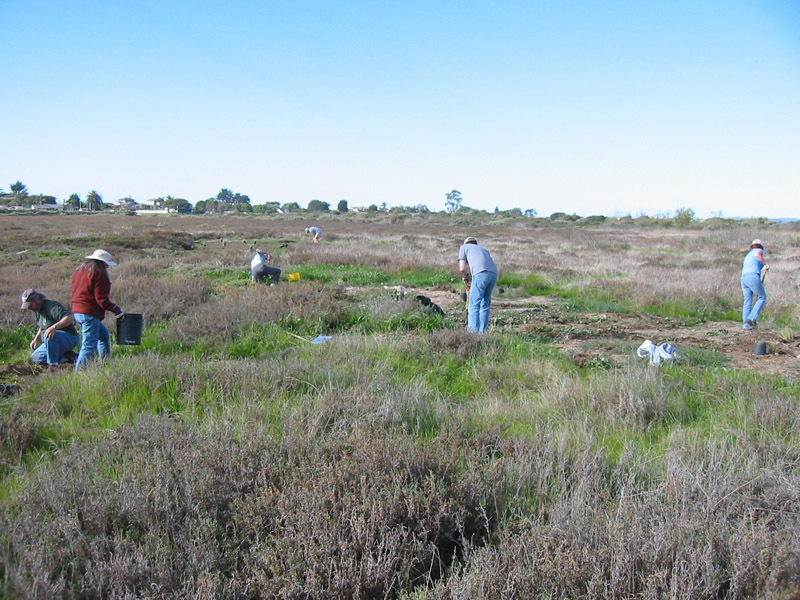 Monday’s event was in the part of the marsh that is owned by the Land Trust for Santa Barbara County. That’s the part beyond (that is, west of) the new footbridge spanning Franklin Creek. It’s interesting to compare it to the city-owned section near Ash Avenue, where a lot of restoration work was done in the late 1990s, and where volunteers have been doing monthly weeding sessions ever since. The Land Trust parcel is weedier (in the sense of having more non-native plants), and also has some bare spots where mud gets dumped during flood-control dredging. In both ecological and aesthetic terms it’s arguably more degraded than the area along Ash Avenue. On the other hand, it’s also farther away from day-to-day human activity. It’s quieter, and wilder. It’s the part of the marsh where the (non-native, I realize, but still very cool) red foxes hang out. On one of my first trips across the footbridge after it was opened last summer, I sat on one of the big, rounded boulders near its western end. There’s a small channel there, with a pool where egrets and herons like to fish. I sat there for a while, enjoying the solitude, and then I noticed an odd sound. It was a sort of whispering, a very low-volume series of pops and clicks, coming from the muddy margin that the low tide had exposed. It took me a second to realize what it was: The sound of hundreds of horn snails crawling through the mud. The Land Trust parcel at the marsh is a work in progress. But I really like it, and it felt good to be able to help it out with some weeding.